The settings dialog contains several tabs with specific settings under each one. This page describes the Buttons tabs. The button to the right of the text description will either display the button currently in use or three dashes --- if the option is unassigned. To select a button input for a particular option click on the button to the right of the text description. Note there is a scroll bar on the right side of the tab. You will need to scroll down to see all options on this tab. This can be either Yes or No. When set to Yes the app will check for POV hat switch inputs. There may be cases when you do not want the Z1 to check for those inputs. If that is tru then you should turn this option off. This is the button assignment to highlight the next button in the sequence of displayed buttons on a particular screen. This is the button assignment to highlight the previous button in the sequence of displayed buttons on a particular screen. This is the button assignment to select the currently highlighted button on a particular screen. This is the button assignment to display the next dashboard associated with the current car. This only works when you are in the car. This is the button assignment to display the previous dashboard associated with the current car. This only works when you are in the car. This allows you to assign a button to turn on or off the 'after stop' display on the track maps. By default the 'after stop' display is shown when you get within a specified number of laps of your stop (3 by default). Note you may use a button to turn it on or off at any time. This is the button assignment to scroll up any windows that have up/down arrows. This is the button assignment to scroll down any windows that have up/down arrows. This is the button assignment to scroll through the various delta options. This lets you change the displayed delta on the fly. The Dashboard will display a message when you change the currently selected delta. This is the button assignment to reset the current delta. This lets you delete any saved splits for the current car and track combination. This is useful if the weather or other changes in the track require the delta to be reset. The Dashboard will display a message when that the delta has been reset when this button is pressed. This is the button assignment to toggle data logging on and off. You must also set the Data Logging option to Button (in the General tab) for this to work. This is the button assignment to increase the brightness of the LEDs in the SMZ1 wheel. This is the button assignment to decrease the brightness of the LEDs in the SMZ1 wheel. Certain buttons change settings within the Z1 Dashboard or your car. These include adding or removing fuel, or changing deltas, etc. When those actions occur a message is displayed on the Dashboard alerting you to the change. The value in this Message Time field is the amount of time, in milliseconds, that the messages are displayed. Certain buttons change settings within the Z1 Dashboard or your car. These include adding or removing fuel, or changing deltas, etc. When those actions occur a message is displayed on the Dashboard alerting you to the change. The value in this vertical position on the screen where that message will appear. 10% is at the top of the screen, and 100% is at the bottom, with other values being in between. This allows you to customize where the message is displayed to suit your purposes. This is the font size used to display the messages on screen. You can assign a specific button to jump directly to a specific screen number within your car's dashboards. Just assign the appropriate button to the desired screen number. The following options are available to iRacing only. This is because iRacing offers the ability to implements these features while other sims do not. This is the button assignment to add fuel in iRacing. This will add one liter to the amount of fuel that will be added at your next pit stop. This is the button assignment to remove fuel in iRacing. This will remove one liter from the amount of fuel that will be added at your next pit stop. This is the button assignment to add the necessary fuel to finish the race in iRacing. This will add the amount of fuel required to finish the race, plus the specified buffer amount (3 liters by default), at your next pit stop. If this is more than the capacity of the fuel tank then you will get a full tank of fuel at the next pit stop. This is the button assignment to tell your pit crew that you do not want to change your tires at the next pit stop. This is the button assignment to tell your pit crew that you wish to have a fast repair at the next pit stop instead of fixing all the damage (if any) that exists on your car. This button will speak all available data to you when you press the button. This button will speak your last lap time when you press the button. This button will speak your current position when you press the button. This button will speak the remaining laps of fuel in the car when you press the button. This button will speak the current lap number when you press the button. 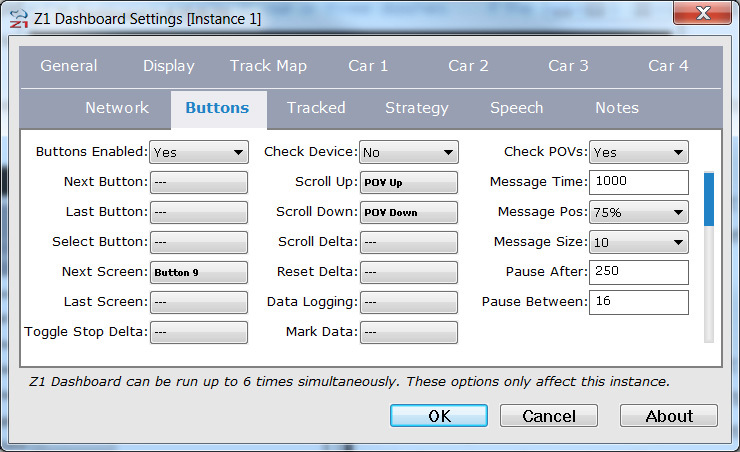 This is the button assignment to tell the Z1 software that you want to start/stop a simulated race. Note that to start a simulated race using a button the Simulated Race option (see Strategy tab) must be set to Start With Button. Also note that if you are running a simulated race and press this button then the simulated race will end regardless of whether it was started with a button or by getting in the car. The reason for this is if you accidentally left the simulated race feature on and then started a real race you would need a way to turn the siultaed race off for your real race.